The early Muslim conquests (Arabic: الفتوحات الإسلامية‎, al-Futūḥāt al-Islāmiyya), also referred to as the Arab conquests and early Islamic conquests began with the Islamic prophet Muhammad in the 7th century. He established a new unified polity in the Arabian Peninsula which under the subsequent Rashidun and Umayyad Caliphates saw a century of rapid expansion. Under the last of the Umayyads, the Arabian empire extended two hundred days journey from east to west, from the confines of Tartary and India to the shores of the Atlantic Ocean ... We should vainly seek the indissoluble union and easy obedience that pervaded the government of Augustus and the Antonines; but the progress of Islam diffused over this ample space a general resemblance of manners and opinions. 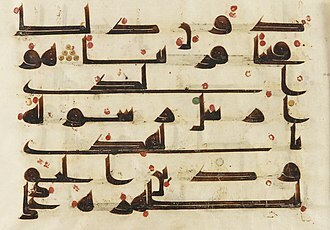 The language and laws of the Quran were studied with equal devotion at Samarcand and Seville: the Moor and the Indian embraced as countrymen and brothers in the pilgrimage of Mecca; and the Arabian language was adopted as the popular idiom in all the provinces to the westward of the Tigris. The Muslim conquests brought about the collapse of the Sassanid Empire and a great territorial loss for the Byzantine Empire. The reasons for the Muslim success are hard to reconstruct in hindsight, primarily because only fragmentary sources from the period have survived. Fred McGraw Donner suggests that formation of a state in the Arabian peninsula and ideological (i.e., religious) coherence and mobilization was a primary reason why the Muslim armies in the space of a hundred years were able to establish the largest pre-modern empire until that time. The estimates for the size of the Islamic Caliphate suggest it was more than thirteen million square kilometers (five million square miles). Most historians agree as well that the Sassanid Persian and Byzantine Roman empires were militarily and economically exhausted from decades of fighting one another. It has been suggested that some Jews and Christians in the Sassanid Empire and Jews and Monophysites in Syria were dissatisfied and welcomed the Muslim forces, largely because of religious conflict in both empires. It has also been suggested that later Syriac Christians reinterpreted the events of the conquest to serve a political or religious interest. At other times, such as in the Battle of Firaz, Arab Christians allied themselves with the Persians and Byzantines against the invaders. In the case of Byzantine Egypt, Palestine and Syria, these lands had been reclaimed from the Persians only a few years before. Arabia was a region that hosted a number of different cultures, some urban and others nomadic Bedouin. Arabian society was divided along tribal and clan lines with the most important divisions being between the "southern" and "northern" tribal associations. Both the Roman and Persian empires competed for influence in Arabia by sponsoring clients, and in turn Arabian tribes sought the patronage of the two rival empires to bolster their own ambitions. The Lakhmid kingdom which covered parts of what is now southern Iraq and northern Saudi Arabia was a client of Persia, and in 602 the Persians deposed the Lakhmids to take over the defense of the southern frontier themselves. This left the Persians exposed and over-extended, helping to set the stage for the collapse of Persia later that century. Southern Arabia, especially what is now Yemen, had for thousands of years been a wealthy region that had been a center of the spice trade. Yemen had been at the center of an international trading network linking Eurasia to Africa and Yemen had been visited by merchants from East Africa, Europe, the Middle East, India and even from as far away as China. In turn, the Yemeni were great sailors, travelling up the Red Sea to Egypt and across the Indian Ocean to India and down the east African coast. Inland, the valleys of Yemen had been cultivated by a system of irrigation that had been set back when the Marib Dam was destroyed by an earthquake in about 450 AD. Frankincense and myrrh had been greatly valued in the Mediterranean region, being used in religious ceremonies. However, the conversion of the Mediterranean world to Christianity had significantly reduced the demand for these commodities, causing a major economic slump in southern Arabia which helped to create the impression that Arabia was a backward region. Little is known of the pre-Islamic religions of Arabia, but it is known that the Arabs worshiped a number of gods such as al-Lat, Manat, al-Uzza and Hubal, with the most important being Allah (God). There were also Jewish and Christian communities in Arabia and aspects of Arab religion reflected their influence. Pilgrimage was a major part of Arabian paganism, and one of the most important pilgrimage sites was Mecca, which housed the Kaaba, considered an especially holy place to visit. 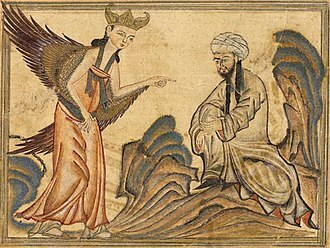 Mohammad, a merchant of Mecca, started to have visions in which he claimed that the Archangel Gabriel had told him that he was the last of the prophets continuing the work of Jesus Christ and the prophets of Tanakh. After coming into conflict with the elite of Mecca, Mohammad fled to the city of Yathrib, which was renamed Medina. At Yathrib, Mohammad founded the first Islamic state and by 630 conquered Mecca. The prolonged and escalating Byzantine–Sassanid wars of the 6th and 7th centuries and the recurring outbreaks of bubonic plague (Plague of Justinian) left both empires exhausted and weakened in the face of the sudden emergence and expansion of the Arabs. The last of these wars ended with victory for the Byzantines: Emperor Heraclius regained all lost territories, and restored the True Cross to Jerusalem in 629. The war against Zoroastrian Persia, whose people worshiped the fire god Ahura Mazda, had been portrayed by Heraclius as a holy war in defense of the Christian faith and the Wood of the Holy Cross, as splinters of wood said to be from the True Cross were known, had been used to inspire Christian fighting zeal. The idea of a holy war against the "fire worshipers", as the Christians called the Zoroastrians, had aroused much enthusiasm, leading to an all-out effort to defeat the Persians. Nevertheless, neither empire was given any chance to recover, as within a few years they were overrun by the advances of the Arabs (newly united by Islam), which, according to Howard-Johnston, "can only be likened to a human tsunami". According to George Liska, the "unnecessarily prolonged Byzantine–Persian conflict opened the way for Islam". In late 620s Muhammad had already managed to conquer and unify much of Arabia under Muslim rule, and it was under his leadership that the first Muslim-Byzantine skirmishes took place in response to Byzantine incursions. Just a few months after Heraclius and the Persian general Shahrbaraz agreed on terms for the withdrawal of Persian troops from occupied Byzantine eastern provinces in 629, Arab and Byzantine troops confronted each other at the Battle of Mu'tah as a result of Byzantine vassals murdering a Muslim emissary. Muhammad died in 632 and was succeeded by Abu Bakr, the first Caliph with undisputed control of the entire Arab peninsula after the successful Ridda Wars, which resulted in the consolidation of a powerful Muslim state throughout the peninsula. In Arabia, swords from India were greatly esteemed as being made of the finest steel, and were the favorite weapons of the Mujahideen. The Arab sword known as the sayfy closely resembled the Roman gladius. 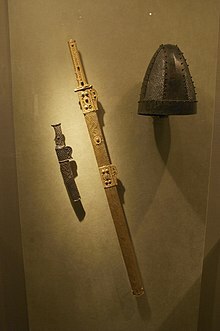 Swords and spears were the major weapons of the Muslims and armour was either mail or leather. In northern Arabia, Roman influence predominated, in eastern Arabia, Persian influence predominated and in Yemen, Indian influence was felt. As the caliphate spread, the Muslims were influenced by the peoples they conquered--the Turks in Central Asia, the Persians, and the Romans in Syria. The Bedouin tribes of Arabia favored archery, though, contrary to popular belief, Bedouin archers usually fought on foot instead of horseback. The Arabs usually fought defensive battles with their archers placed on both flanks. By the Umayyad period, the caliphate had a standing army, including the elite Ahl al-Sham ("people of Syria"), raised from the Arabs who settled in Syria. The caliphate was divided into a number of jund, or regional armies, stationed in the provinces being made of mostly Arab tribes who were paid monthly by the Diwan al-Jaysh (War Ministry). The infantry of the Roman Army continued to be recruited from within the empire, but much of the cavalry were either recruited from "martial" peoples in the Balkans or in Asia Minor or alternatively were Germanic mercenaries. Most of the Roman troops in Syria were indigenae (local) and it seems that at the time of the Muslim conquest, the Roman forces in Syria were Arabs. In response to the loss of Syria, the Romans developed the phylarch system of using Armenian and Christian Arab auxiliaries living on the frontier to provide a "shield" to counter raiding by the Muslims into the empire. Overall, the Roman Army remained a small, but professional force of foederati. Unlike the foederati who were sent where they were needed, the stradioti lived in the frontier provinces. The most famous of these units was the Varangian Guard made up of Vikings. During the last decades of the Sassanian empire, the frequent use of royal titles by Persian governors in Central Asia, especially in what is now Afghanistan, indicates a weakening of the power of the Shahinshah (King of Kings), suggesting the empire was already breaking down at the time of the Muslim conquest. Persian society was rigidly divided into castes with the nobility being of supposed "Aryan" descent, and this division of Persian society along caste lines was reflected in the military. The azatan aristocracy provided the cavalry, the paighan infantry came from the peasantry and most of the greater Persian nobility had slave soldiers, this last being based on the Persian example. Much of the Persian army consisted of tribal mercenaries recruited from the plains south of the Caspian Sea and from what is now Afghanistan. The Persian tactics were cavalry based with the Persian forces usually divided into a center, based upon a hill, and two wings of cavalry on either side. Little is known about the military forces of the Christian state of Ethiopia other than that they were divided into sarawit professional troops and the ehzab auxiliaries. The Ethiopians made much use of camels and elephants. The Berber peoples of North Africa had often served as a federates (auxiliaries) to the Roman Army. The Berber forces were based around the horse and camel, but seemed to have hampered by a lack of weapons or protection with both Roman and Arab sources mentioning the Berbers lacked armour and helmets. The Berbers went to war with their entire communities and the presence of women and children both slowed down the Berber armies and tied down Berber tribesmen who tried to protect their families. The British historian David Nicolle called the Turkish peoples of Central Asia the "most formidable foes" faced by the Muslims. The Jewish Turkish Khazar khanate, based in what is now southern Russia and Ukraine, had a powerful heavy cavalry. The Turkish heartland of Central Asia was divided into five khanates whose khans variously recognized the shahs of Iran or the emperors of China as their overlords. Turkish society was feudal with the khans only being pater primus among the aristocracy of dihquans who lived in castles in the countryside, with the rest of Turkish forces being divided into kadivar (farmers), khidmatgar (servants) and atbai (clients). The heavily armored Turkish cavalry were to play a great role in influencing subsequent Muslim tactics and weapons; the Turks, who were mostly Buddhists at the time of the Islamic conquest, were converted to Islam and, ironically, the Turks came to be regarded as the foremost Muslim warriors, to the extent of replacing the Arabs as the dominant peoples in the Dar-al-Islam (House of Islam). 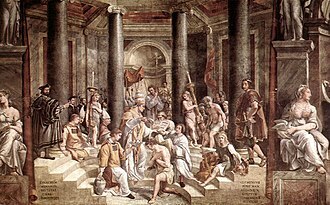 During the migration period, the Germanic Visigoths had traveled from their homeland north of the Danube to settle in the Roman province of Hispania, creating a kingdom upon the wreckage of the Western Roman empire. The Visigothic state in Iberia was based around forces raised by the nobility whom the king could call out in the event of war. The king had his gardingi and fideles loyal to himself while the nobility had their bucellarii. The Visigoths favored cavalry with their favorite tactics being to repeatedly charge a foe combined with feigned retreats. The Muslim conquest of most of Iberia in less than a decade does suggest serious deficiencies with the Visigothic kingdom, though the limited sources make it difficult to discern the precise reasons for the collapse of the Visigoths. Another Germanic people who founded a state upon the ruins of the Western Roman empire were the Franks who settled in Gaul, which came to be known afterwards as France. Like the Visigoths, the Frankish cavalry played a "significant part" in their wars. The Frankish kings expected all of their male subjects to perform three months of military service every year, and all serving under the king's banner were paid a regular salary. Those called up for service had to provide their own weapons and horses, which contributed to the "militarisation of Frankish society". At least part of the reason for the victories of Charles Martel was he could call up a force of experienced warriors when faced with Muslim raids. The province of Syria was the first to be wrested from Byzantine control. Arab-Muslim raids that followed the Ridda wars prompted the Byzantines to send a major expedition into southern Palestine, which was defeated by the Arab forces under command of Khalid ibn al-Walid at the Battle of Ajnadayn (634). Ibn al-Walid, had converted to Islam around 627, becoming one of Mohammad's most successful generals. Ibn al-Walid had been fighting in Iraq against the Persians when he led his force on a trek across the deserts to Syria to attack the Romans from the rear. In the "Battle of the Mud" fought outside of Pella in the Jordan river valley in January 635 the Arabs won another victory. After a siege of six months the Arabs took Damascus, but Emperor Heraclius later retook it. At the battle of Yarmuk between 16–20 August 636, the Arabs were victorious, defeating Heraclius. Ibn al-Walid appears to have been the "real military leader" at Yarmuk "under the nominal command of others". Syria was ordered to be abandoned to the Muslims with Heraclius reportedly saying: "Peace be with you Syria; what a beautiful land you will be for your enemy". On the heels of their victory, the Arab armies took Damascus again in 636, with Baalbek, Homs, and Hama to follow soon afterwards. However, other fortified towns continued to resist despite the rout of the imperial army and had to be conquered individually. Jerusalem fell in 638, Caesarea in 640, while others held out until 641. After a two-year siege, the garrison of Jerusalem surrendered rather than starve to death; under the terms of the surrender Caliph Umar promised to tolerate the Christians of Jerusalem and not to turn churches into mosques. True to his word, the Caliph Umar allowed the Church of the Holy Sepulchre to remain, with the caliph praying on a prayer rug outside of the church. The loss to the Muslims of Jerusalem, the holiest city to Christians, proved to be the source of much resentment in Christendom. The city of Caesarea Maritima continued to withstand the Muslim siege--as it could be supplied by sea--until it was taken by assault in 640. In the mountains of Asia Minor, the Muslims enjoyed less success, with the Romans adopting the tactic of "shadowing warfare"--refusing to give battle to the Muslims, while the people retreated into castles and fortified towns when the Muslims invaded; instead, Roman forces ambushed Muslim raiders as they returned to Syria carrying plunder and people they had enslaved. In the frontier area where Anatolia met Syria, the Roman state evacuated the entire population and laid waste to the countryside, creating a "no-man's land" where any invading army would find no food. For decades afterwards, a guerrilla war was waged by Christians in the hilly countryside of north-western Syria supported by the Romans. At the same time, the Romans began a policy of launching raids via sea on the coast of the caliphate with the aim of forcing the Muslims to keep at least some of their forces to defend their coastlines, thus limiting the number of troops available for an invasion of Anatolia. Unlike Syria with its plains and deserts-which favored the offensive-the mountainous terrain of Anatolia favored the defensive and for centuries afterwards, the line between Christian and Muslim lands ran along the border between Anatolia and Syria. The Byzantine province of Egypt held strategic importance for its grain production, naval yards, and as a base for further conquests in Africa. The Muslim general 'Amr ibn al-'As began the conquest of the province on his own initiative in 639. The majority of the Roman forces in Egypt were locally-raised Coptic forces, intended to serve more as a police force; since the vast majority of Egyptians lived in the Nile river valley, surrounded on both the eastern and western sides by desert, Egypt was felt to be a relatively secure province. In December 639, al-'As entered the Sinai with a large force and took Pelusium, on the edge of the Nile river valley, and then defeated a Roman counter-attack at Bibays. Contrary to expectations, the Arabs did not head for Alexandria, the capital of Egypt, but instead for a major fortress known as Babylon located at what is now Cairo. Al-'As was planning to divide the Nile river valley in two. The Arab forces won a major victory at the Battle of Heliopolis (640), but they found it difficult to advance further because major cities in the Nile Delta were protected by water and because al-'As lacked the machinery to break down city fortifications. The Arabs laid siege to Babylon, and its starving garrison surrendered on 9 April 641. Nevertheless, the province was scarcely urbanized and the defenders lost hope of receiving reinforcements from Constantinople when the emperor Heraclius died in 641. Afterwards, the Arabs turned north into the Nile delta and laid siege to Alexandria. The last major center to fall into Arab hands was Alexandria, which capitulated in September 642. According to Hugh Kennedy, "Of all the early Muslim conquests, that of Egypt was the swiftest and most complete. [...] Seldom in history can so massive a political change have happened so swiftly and been so long lasting." In 644, the Arabs suffered a major defeat by the Caspian Sea when an invading Muslim army was almost wiped out by the cavalry of the Khazar Khanate, and, seeing a chance to take back Egypt, the Romans launched an amphibious attack which took back Alexandria for a short period of time. Though most of Egypt is desert, the Nile river valley has some of the most productive and fertile farmland in the entire world, which had made Egypt the "granary" of the Roman empire. Control of Egypt meant that the caliphate could weather droughts without the fear of famine, laying the basis for the future prosperity of the caliphate. 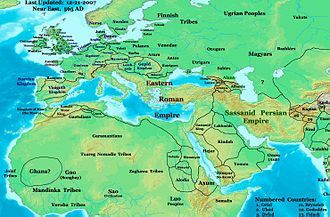 The Roman empire had traditionally dominated the Mediterranean and the Black Sea with major naval bases at Constantinople, Acre, Alexandria and Carthage. In 652, the Arabs won their first victory at sea off Alexandria, which was followed by the temporary Muslim conquest of Cyprus. As Yemen had been a center of maritime trade, Yemeni sailors were brought to Alexandria to start building an Islamic fleet for the Mediterranean. The Muslim fleet was based in Alexandria and used Acre, Tyre and Beirut as its forward bases. The core of the fleet's sailors were Yemeni, but the shipwrights who built the ships were Iranian and Iraqi. In the "Battle of the Masts" off Cape Chelidonia in Anatolia in 655, the Muslims defeated the Roman fleet in a series of boarding actions. As a result, the Romans began a major expansion of their navy, which was matched by the Arabs, leading to a naval arms race. From the early 8th century onward, the Muslim fleet would launch annual raids on the coastline on the Roman empire in Anatolia and Greece. As part of the arms race, both sides sought new technology to improve their warships. The Muslim warships had a larger forecastle, which was used to mount a stone-throwing engine. The Romans invented "Greek fire", an incendiary weapon that led the Muslims to cover their ships with water-soaked cotton. A major problem for the Muslim fleet was the shortage of timber, which led the Muslims to seek qualitative instead of quantitative superiority by building bigger warships. To save money, the Muslim shipwrights switched from the hull-first method of building ships to the frame-first method. After an Arab incursion into Sasanian territories, the energetic shah (king) Yazdgerd III, who had just ascended the Persian throne, raised an army to resist the conquerors. Many of the marzbans refused to come out to help the shahinshah. However, the Persians suffered a devastating defeat at the Battle of al-Qadisiyyah in 636. Little is known about the Battle of al-Qadisiyyah other than it lasted for several days by the banks of the river Euphrates in what is now Iraq and ended with the Persian force being annihilated. Abolishing the Lakhmid Arab buffer state had forced the Persians to take over the desert defense themselves, leaving them overextended. As a result of al-Qadisiyyah, the Arab-Muslims gained control over the whole of Iraq, including Ctesiphon, the capital city of the Sassanids. The Persians lacked sufficient forces to make use of the Zagros mountains to stop the Arabs, having lost the prime of their army at al-Qadisiyyah. The Persian forces withdrew over the Zagros mountains and the Arab army pursued them across the Iranian plateau, where the fate of the Sasanian empire was sealed at the Battle of Nahavand (642). The crushing Muslim victory at Nahavand is known in the Muslim world as the "Victory of Victories". Great armies that destroyed our county's foes? Right from the start of the caliphate, it was realized that there was a need to write down the sayings and story of Muhammad, which had been memorized by his followers before they all died. Most people in Arabia were illiterate and the Arabs had a strong culture of remembering history orally. 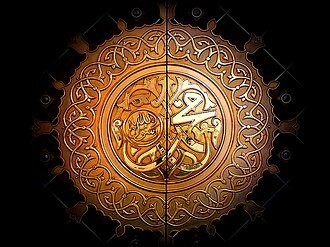 To preserve the story of Mohammad and to prevent any corruptions from entering the oral history, the Caliph 'Abu Bakr had ordered scribes to write down the story of Mohammad as told to them by his followers, which was the origin of the Koran. 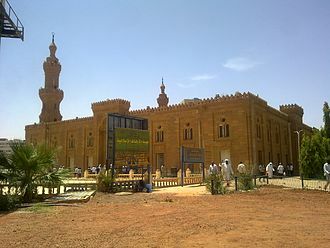 Disputes had emerged over which version of the Koran was the correct one and, by 644, different versions of the Koran were accepted in Damascus, Basra, Hims, and Kufa. 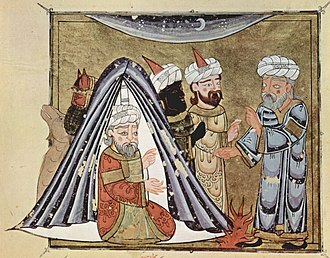 To settle the dispute, the Caliph 'Uthman had proclaimed the version of the Koran possessed by one of Mohammad's widows, Hafsa, to be the definitive and correct version, which offended some Muslims who held to the rival versions. This, together with the favoritism shown by 'Uthman to his own clan, the Banu Umayya, in government appointments, led to a mutiny in Medina in 656 and 'Uthman's murder. 'Uthman's successor as Caliph, Mohammad's son-in-law, Ali, was faced with a civil war, known to Muslims as the fitna, when the governor of Syria, Mu'awiya Ibn Abi Sufyan, revolted against him. During this time, the first period of Muslim conquests stopped, as the armies of Islam turned against one another. A fundamentalist group known as the Kharaji decided to end the civil war by assassinating the leaders of both sides. However, the fitna ended in January 661 when the Caliph Ali was killed by a Kharaji assassin, allowing Mu'awiya to become Caliph and found the Umayyad dynasty. The fitna also marked the beginning of the split between Shia Muslims, who supported Ali, and Sunni Muslims, who opposed him. Mu'awiya moved the capital of the caliphate from Medina to Damascus, which had a major effect on the politics and culture of the caliphate. Mu'awiya followed the conquest of Iran by invading Central Asia and trying to finish off the Roman Empire by taking Constantinople. In 670, a Muslim fleet seized Rhodes and then laid siege to Constantinople. Nicolle wrote the siege of Constantinople from 670 to 677 was "more accurately" a blockade rather than a siege proper, which ended in failure as the "mighty" walls built by the Emperor Theodosius II in the 5th century AD proved their worth. The majority of the people in Syria remained Christian, and a substantial Jewish minority remained, as well; both communities were to teach the Arabs much about science, trade and the arts. 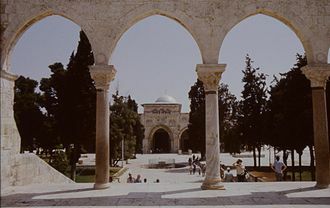 The Umayyad caliphs are well-remembered for sponsoring a cultural "golden age" in Islamic history--for example, by building the Dome of the Rock in Jerusalem, and for making Damascus into the capital of a "superpower" that stretched from Portugal to Central Asia, covering the vast territory from the Atlantic Ocean to the borders of China. The rapidity of the early conquests has received various explanations. Contemporary Christian writers conceived them as God's punishment visited on their fellow Christians for their sins. Early Muslim historians viewed them as a reflection of the religious zeal of the conquerors and evidence of divine favor. The theory that the conquests are explainable as an Arab migration triggered by economic pressures enjoyed popularity early in the 20th century, but has largely fallen out of favor among historians, especially those who distinguish the migration from the conquests that preceded and enabled it. There are indications that the conquests started as initially disorganized pillaging raids launched partly by non-Muslim Arab tribes in the aftermath of the Ridda wars, and were soon extended into a war of conquest by the Rashidun caliphs, although other scholars argue that the conquests were a planned military venture already underway during Muhammad's lifetime. Fred Donner writes that the advent of Islam "revolutionized both the ideological bases and the political structures of the Arabian society, giving rise for the first time to a state capable of an expansionist movement." According to Chase F. Robinson, it is likely that Muslim forces were often outnumbered, but, unlike their opponents, they were fast, well coordinated and highly motivated. Another key reason was the weakness of the Byzantine and Sasanian empires, caused by the wars they had waged against each other in the preceding decades with alternating success. It was aggravated by a plague that had struck densely populated areas and impeded conscription of new imperial troops, while the Arab armies could draw recruits from nomadic populations. The Sasanian empire, which had lost the latest round of hostilities with the Byzantines, was also affected by a crisis of confidence, and its elites suspected that the ruling dynasty had forfeited the favor of the gods. The Arab military advantage was increased when Christianized Arab tribes who had served imperial armies as regular or auxiliary troops switched sides and joined the West Arabian coalition. Arab commanders also made liberal use of agreements to spare lives and property of inhabitants in case of surrender and extended exemptions from paying tribute to groups who provided military services to the conquerors. Additionally, the Byzantine persecution of Christians opposed to the Chalcedonian creed in Syria and Egypt alienated elements of those communities and made them more open to accommodation with the Arabs once it became clear that the latter would let them practice their faith undisturbed as long as they paid tribute. The conquests were further secured by the subsequent large-scale migration of Arabian peoples into the conquered lands. 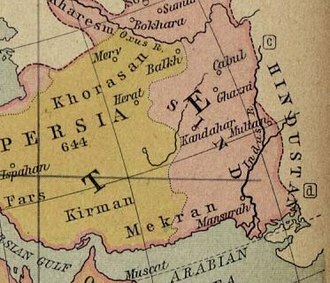 Robert Hoyland argues that the failure of the Sasanian empire to recover was due in large part to the geographically and politically disconnected nature of Persia, which made coordinated action difficult once the established Sasanian rule collapsed. Similarly, the difficult terrain of Anatolia made it difficult for the Byzantines to mount a large-scale attack to recover the lost lands, and their offensive action was largely limited to organizing guerrilla operations against the Arabs in the Levant. Although there were sporadic incursions by Arab generals in the direction of India in the 660s and a small Arab garrison was established in the arid region of Makran in the 670s, the first large-scale Arab campaign in the Indus valley occurred when the general Muhammad bin Qasim invaded Sindh in 711 after a coastal march through Makran. Three years later the Arabs controlled all of the lower Indus valley. 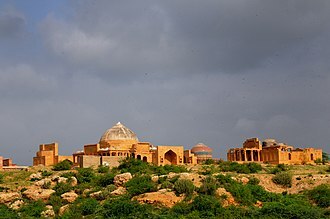 Most of the towns seem to have submitted to Arab rule under peace treaties, although there was fierce resistance in other areas, including by the forces of Raja Dahir at the capital city Debal. Arab incursions southward from Sindh were repulsed by the armies of Gurjara and Chalukya kingdoms, and further Islamic expansion was checked by the Rashtrakuta empire, which gained control of the region shortly after. Arab forces began launching sporadic raiding expeditions into Cyrenaica (modern northeast Libya) and beyond soon after their conquest of Egypt. Byzantine rule in northwest Africa at the time was largely confined to the coastal plains, while autonomous Berber polities controlled the rest. In 670 Arabs founded the settlement of Qayrawan, which gave them a forward base for further expansion. Muslim historians credit the general Uqba ibn Nafi with subsequent conquest of lands extending to the Atlantic coast, although it appears to have been a temporary incursion. The Berber chief Kusayla and an enigmatic leader referred to as Kahina (prophetess or priestess) seem to have mounted effective, if short-lived resistance to Muslim rule at the end of the 7th century, but the sources do not give a clear picture of these events. Arab forces were able to capture Carthage in 698 and Tangiers by 708. After the fall of Tangiers, many Berbers joined the Muslim army. In 740 Umayyad rule in the region was shaken by a major Berber revolt, which also involved Berber Kharijite Muslims. After a series of defeats, the caliphate was finally able to crush the rebellion in 742, although local Berber dynasties continued to drift away from imperial control from that time on. The Muslim conquest of Iberia is notable for the brevity and unreliability of the available sources. After the Visigothic king of Spain Wittiza died in 710, the kingdom experienced a period of political division. The Visigothic nobility was divided between the followers of Wittiza and the new king Roderic. 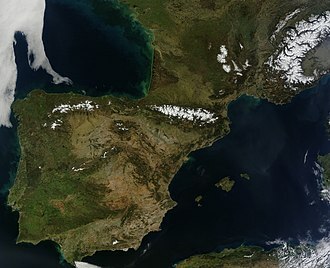 Akhila, Wittiza's son, had fled to Morocco after losing the succession struggle and Muslim tradition states that he asked the Muslims to invade Spain. Starting in the summer of 710, the Muslim forces in Morocco had launched several successful raids into Spain, which demonstrated the weakness of the Visigothic state. Taking advantage of the situation, the Muslim Berber commander, Tariq ibn Ziyad, who was stationed in Tangiers at the time, crossed the straits with an army of Arabs and Berbers in 711. Most of the invasion force of 15,000 were Berbers, with the Arabs serving as an "elite" force. Ziyad landed on the Rock of Gibraltar on 29 April 711. After defeating the forces of king Roderic at the river Guaddalete on 19 July 711, Muslim forces advanced, capturing cities of the Gothic kingdom one after another. The capital of Toledo surrendered peacefully. Some of the cities surrendered with agreements to pay tribute and local aristocracy retained a measure of former influence. The Spanish Jewish community welcomed the Muslims as liberators from the oppression of the Catholic Visigothic kings. In 712, another larger force of 18,000 from Morocco, led by Musa Ibn Nusayr, crossed the Straits of Gibraltar to link up with Ziyad's force at Talavera. The invasion seemed to have entirely on the initiative of Tariq ibn Ziyad: the caliph, al-Walid, in Damascus reacted as if it was a surprise to him. By 713 Iberia was almost entirely under Muslim control. In 714, al-Walid summoned Ziyad to Damascus to explain his campaign in Spain, but Ziyad took his time travelling through North Africa and Palestine, and was finally imprisoned when he arrived in Damascus. The events of the subsequent ten years, the details of which are obscure, included the capture of Barcelona and Narbonne, and a raid against Toulouse, followed by an expedition into Burgundy in 725. The last large-scale raid to the north ended with a Muslim defeat at the Battle of Tours at the hands of the Franks in 732. The victory of the Franks, led by Charles Martel, over 'Abd al-Rahman Ibn 'Abd Allah al-Ghafiqi has often been misrepresented as the decisive battle that stopped the Muslim conquest of France, but the Umayyad force had been raiding Aquitaine with a particular interest in sacking churches and monasteries, not seeking its conquest. The battle itself is a shadowy affair with the few sources describing it in poetic terms that are frustrating for the historian. The battle occurred between 18–25 October 732 with the climax being an attack on the Muslim camp led by Martel that ended with al-Ghafiqi being killed and the Muslims withdrawing when night fell. Martel's victory ended whatever plans there may have been to conquer France, but a series of Berber revolts in North Africa and in Spain against Arab rule may have played a greater role in ruling out conquests north of the Pyrenees. Transoxiana is the region northeast of Iran beyond the Amu Darya or Oxus River roughly corresponding with modern-day Uzbekistan, Tajikistan, and parts of Kazakhstan. 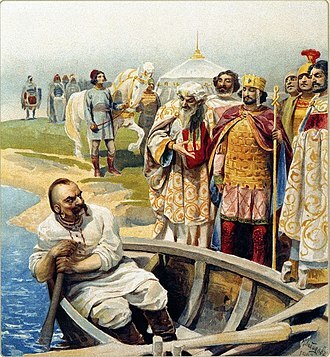 Initial incursions across the Oxus river were aimed at Bukhara (673) and Samarqand (675) and their results were limited to promises of tribute payments. In 674, a Muslim force led by Ubaidullah Ibn Zayyad attacked Bukhara, the capital of Soghdia, which ended with the Sogdians agreeing to recognize the Umayadd caliph Mu'awiaya as their overlord and to pay tribute. 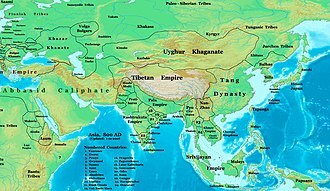 In general, the campaigns in Central Asia were "hard fought" with the Buddhist Turkic peoples fiercely resisting efforts to incorporate them into the caliphate. China, which saw Central Asia as its own sphere of influence, particularly due to the economic importance of the Silk Road, supported the Turkic defenders. Further advances were hindered for a quarter century by political upheavals within the Umayyad caliphate. This was followed by a decade of rapid military progress under the leadership of the new governor of Khurasan, Qutayba ibn Muslim, which included the conquest of Bukhara and Samarqand in 706–712. The expansion lost its momentum when Qutayba was killed during an army mutiny and the Arabs were placed on the defensive by an alliance of Sogdian and Türgesh forces with support from Tang China. However, reinforcements from Syria helped turn the tide and most of the lost lands were reconquered by 741. Muslim rule over Transoxania was consolidated a decade later when a Chinese-led army was defeated at the Battle of Talas (751). Medieveal Islamic scholars divided modern-day Afghanistan into two regions – the provinces of Khorasan and Sistan. Khorasan was the eastern satrapy of the Sasanian Empire, containing Balkh and Herat. Sistan included a number of Afghan cities and regions, including Ghazna, Zarang, Bost, Qandahar (also called al-Rukhkhaj or Zamindawar), Kabul, Kabulistan and Zabulistan. Before Muslim rule, the regions of Balkh (Bactria or Tokharistan), Herat and Sistan were under Sasanian rule. Further south in the Balkh region, in Bamiyan, indication of Sasanian authority diminishes, with a local dynasty apparently ruling from late antiquity, probably Hepthalites subject to the Yabgu of the Western Turkic Khaganate. While Herat was controlled by the Sasanians, its hinterlands were controlled by northern Hepthalites who continued to rule the Ghurid mountains and river valleys well into the Islamic era. Sistan was under Sasanian administration but Qandahar remained out of Arab hands. Kabul and Zabulistan housed Indic religions, with the Zunbils and Kabul Shahis offering stiff resistance to Muslim rule for two centuries until the Saffarid and Ghaznavid conquests. In 646 a Byzantine naval expedition was able to briefly recapture Alexandria. The same year Mu'awiya, the governor of Syria and future founder of the Umayyad dynasty, ordered construction of a fleet. Three years later it was put to use in a pillaging raid of Cyprus, soon followed by a second raid in 650 that concluded with a treaty under which Cypriots surrendered many of their riches and slaves. In 688 the island was made into a joint dominion of the caliphate and the Byzantine empire under a pact which was to last for almost 300 years. In 639–640 Arab forces began to make advances into Armenia, which had been partitioned into a Byzantine province and a Sasanian province. There is considerable disagreement among ancient and modern historians about events of the following years, and nominal control of the region may have passed several times between Arabs and Byzantines. Although Muslim dominion was finally established by the time the Umayyads acceded to power in 661, it was not able to implant itself solidly in the country, and Armenia experienced a national and literary efflorescence over the next century. As with Armenia, Arab advances into other lands of the Caucasus region, including Georgia, had as their end assurances of tribute payment and these principalities retained a large degree of autonomy. This period also saw a series of clashes with the Khazar kingdom whose center of power was in the lower Volga steppes, and which vied with the caliphate over control of the Caucasus. Other Muslim military ventures were met with outright failure. Despite a naval victory over the Byzantines in 654 at the Battle of the Masts, the subsequent attempt to besiege Constantinople was frustrated by a storm which damaged the Arab fleet. Later sieges of Constantinople in 668–669 (674–78 according to other estimates) and 717–718 were thwarted with the help of the recently invented Greek fire. In the east, although Arabs were able to establish control over most Sasanian-controlled areas of modern Afghanistan after the fall of Persia, the Kabul region resisted repeated attempts at invasion and would continue to do so until it was conquered by the Saffarids three centuries later. By the time of the Abbasid revolution in the middle of the 8th century, Muslim armies had come against a combination of natural barriers and powerful states that impeded any further military progress. The wars produced diminishing returns in personal gains and fighters increasingly left the army for civilian occupations. The priorities of the rulers also shifted from conquest of new lands to administration of the acquired empire. Although the Abbasid era witnessed some new territorial gains, such as the conquests of Sicily and Crete, the period of rapid centralized expansion would now give way to an era when further spread of Islam would be slow and accomplished through the efforts of local dynasties, missionaries, and traders. Nicolle wrote that the series of Islamic conquests of the 7th and 8th centuries was "one of the most significant events in world history", leading to the creation of "a new civilisation", the Islamicised and Arabised Middle East. Islam, which had previously been confined to Arabia, became a major world religion, while the synthesis of Arab, Roman, and Persian elements led to distinctive new styles of art and architecture emerging in the Middle East. The military victories of armies from the Arabian Peninsula heralded the expansion of the Arabs' culture and religion. The conquests were followed by a large-scale migration of families and whole tribes from Arabia into the lands of the Middle East. The conquering Arabs had already possessed a complex and sophisticated society. Emigrants from Yemen brought with them agricultural, urban, and monarchical traditions; members of the Ghassanid and Lakhmid tribal confederations had experience collaborating with the empires. The rank and file of the armies was drawn from both nomadic and sedentary tribes, while the leadership came mainly from the merchant class of the Hejaz. Two fundamental policies were implemented during the reign of the second caliph Umar (634–44): the bedouins would not be allowed to damage agricultural production of the conquered lands and the leadership would cooperate with the local elites. To that end, the Arab-Muslim armies were settled in segregated quarters or new garrison towns such as Basra, Kufa and Fustat. The latter two became the new administrative centers of Iraq and Egypt, respectively. Soldiers were paid a stipend and prohibited from seizing lands. Arab governors supervised collection and distribution of taxes, but otherwise left the old religious and social order intact. At first, many provinces retained a large degree of autonomy under the terms of agreements made with Arab commanders. As the time passed, the conquerors sought to increase their control over local affairs and make existing administrative machinery work for the new regime. This involved several types of reorganization. In the Mediterranean region, city-states which traditionally governed themselves and their surrounding areas were replaced by a territorial bureaucracy separating town and rural administration. In Egypt, fiscally independent estates and municipalities were abolished in favor of a simplified administrative system. In the early eighth century, Syrian Arabs began to replace Coptic functionaries and communal levies gave way to individual taxation. In Iran, the administrative reorganization and construction of protective walls prompted agglomeration of quarters and villages into large cities such as Isfahan, Qazvin, and Qum. Local notables of Iran, who at first had almost complete autonomy, were incorporated into the central bureaucracy by the ʿAbbasid period. The similarity of Egyptian and Khurasanian official paperwork at the time of the caliph al-Mansur (754–75) suggests a highly centralized empire-wide administration. The society of new Arab settlements gradually became stratified into classes based on wealth and power. It was also reorganized into new communal units that preserved clan and tribal names but were in fact only loosely based around old kinship bonds. Arab settlers turned to civilian occupations and in eastern regions established themselves as a landed aristocracy. At the same time, distinctions between the conquerors and local populations began to blur. In Iran, the Arabs largely assimilated into local culture, adopting the Persian language and customs, and marrying Persian women. In Iraq, non-Arab settlers flocked to garrison towns. Soldiers and administrators of the old regime came to seek their fortunes with the new masters, while slaves, laborers and peasants fled there seeking to escape the harsh conditions of life in the countryside. 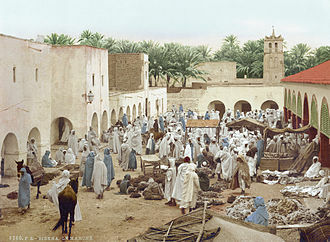 Non-Arab converts to Islam were absorbed into the Arab-Muslim society through an adaptation of the tribal Arabian institution of clientage, in which protection of the powerful was exchanged for loyalty of the subordinates. The clients (mawali) and their heirs were regarded as virtual members of the clan. The clans became increasingly economically and socially stratified. For example, while the noble clans of the Tamim tribe acquired Persian cavalry units as their mawali, other clans of the same tribe had slave laborers as theirs. Slaves often became mawali of their former masters when they were freed. Contrary to the belief of earlier historians, there is no evidence of mass conversions to Islam in the immediate aftermath of the conquests. The first groups to convert were Christian Arab tribes, although some of them retained their religion into the Abbasid era even while serving as troops of the caliphate. They were followed by former elites of the Sasanian empire, whose conversion ratified their old privileges. With time, the weakening of non-Muslim elites facilitated the breakdown of old communal ties and reinforced the incentives of conversion which promised economic advantages and social mobility. By the beginning of the eighth century, conversions became a policy issue for the caliphate. They were favored by religious activists, and many Arabs accepted the equality of Arabs and non-Arabs. However, conversion was associated with economic and political advantages, and Muslim elites were reluctant to see their privileges diluted. Public policy towards converts varied depending on the region and was changed by successive Umayyad caliphs. These circumstances provoked opposition from non-Arab converts, whose ranks included many active soldiers, and helped set the stage for the civil war which ended with the fall of the Umayyad dynasty. The Arab-Muslim conquests followed a general pattern of nomadic conquests of settled regions, whereby conquering peoples became the new military elite and reached a compromise with the old elites by allowing them to retain local political, religious, and financial authority. Peasants, workers, and merchants paid taxes, while members of the old and new elites collected them. Payment of taxes, which for peasants often reached half of the value of their produce, was not only an economic burden, but also a mark of social inferiority. Scholars differ in their assessment of relative tax burdens before and after the conquests. John Esposito states that in effect this meant lower taxes. According to Bernard Lewis, available evidence suggests that the change from Byzantine to Arab rule was "welcomed by many among the subject peoples, who found the new yoke far lighter than the old, both in taxation and in other matters". In contrast, Norman Stillman writes that although the tax burden of the Jews under early Islamic rule was comparable to that under previous rulers, Christians of the Byzantine Empire (though not Christians of the Persian empire, whose status was similar to that of the Jews) and Zoroastrians of Iran shouldered a considerably heavier burden in the immediate aftermath of the conquests. In the wake of the early conquests taxes could be levied on individuals, on the land, or as collective tribute. During the first century of Islamic expansion, the words jizya and kharaj were used in all three senses, with context distinguishing between individual and land taxes. Regional variations in taxation at first reflected the diversity of previous systems. The Sasanian Empire had a general tax on land and a poll tax having several rates based on wealth, with an exemption for aristocracy. This poll tax was adapted by Arab rulers, so that the aristocracy exemption was assumed by the new Arab-Muslim elite and shared by local aristocracy who converted to Islam. The nature of Byzantine taxation remains partly unclear, but it appears to have been levied as a collective tribute on population centers and this practice was generally followed under the Arab rule in former Byzantine provinces. Collection of taxes was delegated to autonomous local communities on the condition that the burden be divided among its members in the most equitable manner. In most of Iran and Central Asia local rulers paid a fixed tribute and maintained their autonomy in tax collection. Difficulties in tax collection soon appeared. Egyptian Copts, who had been skilled in tax evasion since Roman times, were able to avoid paying the taxes by entering monasteries, which were initially exempt from taxation, or simply by leaving the district where they were registered. This prompted imposition of taxes on monks and introduction of movement controls. In Iraq, many peasants who had fallen behind with their tax payments converted to Islam and abandoned their land for Arab garrison towns in hope of escaping taxation. Faced with a decline in agriculture and a treasury shortfall, the governor of Iraq, al-Hajjaj, forced peasant converts to return to their lands and subjected them to the taxes again, effectively forbidding them from converting to Islam. In Khorasan, a similar phenomenon forced the native aristocracy to compensate for the shortfall in tax collection out of their own pockets, and they responded by persecuting peasant converts and imposing heavier taxes on poor Muslims. The situation where conversion to Islam was penalized in an Islamic state could not last, and the devout Umayyad caliph Umar II (717–720) has been credited with changing the taxation system. Modern historians doubt this account, although details of the transition to the system of taxation elaborated by Abbasid-era jurists are still unclear. Umar II ordered governors to cease collection of taxes from Muslim converts, but his successors obstructed this policy and some governors sought to stem the tide of conversions by introducing additional requirements such as circumcision and the ability to recite passages from the Quran. Taxation-related grievances of non-Arab Muslims contributed to the opposition movements which resulted in the Abbasid revolution. Under the new system that was eventually established, kharaj came to be regarded as a tax levied on the land, regardless of the taxpayer's religion. The poll-tax was no longer levied on Muslims, but the treasury did not necessarily suffer and converts did not gain as a result, since they had to pay zakat, which was probably instituted as a compulsory tax on Muslims around 730. The terminology became specialized during the Abbasid era, so that kharaj no longer meant anything more than land tax, while the term jizya was restricted to the poll-tax on dhimmis. The influence of jizya on conversion has been a subject of scholarly debate. Julius Wellhausen held that the poll tax amounted to so little that exemption from it did not constitute sufficient economic motive for conversion. Similarly, Thomas Arnold states that jizya was "too moderate" to constitute a burden, "seeing that it released them from the compulsory military service that was incumbent on their Muslim fellow subjects." He further adds that converts escaping taxation would have to pay the legal alms, zakat, that is annually levied on most kinds of movable and immovable property. Other early 20th century scholars suggested that non-Muslims converted to Islam en masse in order to escape the poll tax, but this theory has been challenged by more recent research. Daniel Dennett has shown that other factors, such as desire to retain social status, had greater influence on this choice in the early Islamic period. The Arab conquerors did not repeat the mistake made by the Byzantine and Sasanian empires, who had tried and failed to impose an official religion on subject populations, which had caused resentments that made the Muslim conquests more acceptable to them. Instead, the rulers of the new empire generally respected the traditional middle-Eastern pattern of religious pluralism, which was not one of equality but rather of dominance by one group over the others. After the end of military operations, which involved sacking of some monasteries and confiscation of Zoroastrian fire temples in Syria and Iraq, the early caliphate was characterized by religious tolerance and peoples of all ethnicities and religions blended in public life. Before Muslims were ready to build mosques in Syria, they accepted Christian churches as holy places and shared them with local Christians. In Iraq and Egypt, Muslim authorities cooperated with Christian religious leaders. Numerous churches were repaired and new ones built during the Umayyad era. The first Umayyad caliph Muawiyah sought to reassure the conquered peoples that he was not hostile to their religions and made an effort to enlist support from Christian Arab elites. There is no evidence for public display of Islam by the state before the reign of Abd al-Malik (685–705), when Quranic verses and references to Muhammad suddenly became prominent on coins and official documents. This change was motivated by a desire to unify the Muslim community after the second civil war and rally them against their chief common enemy, the Byzantine empire. A further change of policy occurred during the reign of Umar II (717–720). The disastrous failure of the siege of Constantinople in 718 which was accompanied by massive Arab casualties led to a spike of popular animosity among Muslims toward Byzantium and Christians in general. At the same time, many Arab soldiers left the army for civilian occupations and they wished to emphasize their high social status among the conquered peoples. These events prompted introduction of restrictions on non-Muslims, which, according to Hoyland, were modeled both on Byzantine curbs on Jews, starting with the Theodosian Code and later codes, which contained prohibitions against building new synagogues and giving testimony against Christians, and on Sassanid regulations that prescribed distinctive attire for different social classes. In the following decades Islamic jurists elaborated a legal framework in which other religions would have a protected but subordinate status. Islamic law followed the Byzantine precedent of classifying subjects of the state according to their religion, in contrast to the Sasanian model which put more weight on social than on religious distinctions. In theory, like the Byzantine empire, the caliphate placed severe restrictions on paganism, but in practice most non-Abrahamic communities of the former Sasanian territories were classified as possessors of a scripture (ahl al-kitab) and granted protected (dhimmi) status. In Islam, Christians and Jews are seen as "Peoples of the Book" as the Muslims accept both Jesus Christ and the Jewish prophets as their own prophets, which accorded them a respect that was not reserved to the "heathen" peoples of Iran, Central Asia and India. In places like the Levant and Egypt, both Christians and Jews were allowed to maintain their churches and synagogues and keep their own religious organizations in exchange for paying the jizya tax. At times, the caliphs engaged in triumphalist gestures, like building the famous Dome of the Rock mosque in Jerusalem from 690-692 on the site of the Jewish Second Temple, which had been destroyed by the Romans in 70 AD--though the use of Roman and Sassanian symbols of power in the mosque suggests its purpose was partly to celebrate the Arab victories over the two empires. Those Christians out of favor with the prevailing orthodoxy in the Roman empire often preferred to live under Muslim rule as it meant the end of persecution. As both the Jewish and Christian communities of the Levant and North Africa were better educated than their conquerors, they were often employed as civil servants in the early years of the caliphate. However, a reported saying of Muhammad that "Two religions may not dwell together in Arabia" led to different policies being pursued in Arabia with conversion to Islam being imposed rather than merely encouraged. With the notable exception of Yemen, where a large Jewish community existed right up until the middle of the 20th century, all of the Christian and Jewish communities in Arabia "completely disappeared". The Jewish community of Yemen seems to have survived as Yemen was not regarded as part of Arabia proper in the same way that the Hejaz and the Nejd were. Mark R. Cohen writes that the jizya paid by Jews under Islamic rule provided a "surer guarantee of protection from non-Jewish hostility" than that possessed by Jews in the Latin West, where Jews "paid numerous and often unreasonably high and arbitrary taxes" in return for official protection, and where treatment of Jews was governed by charters which new rulers could alter at will upon accession or refuse to renew altogether. The Pact of Umar, which stipulated that Muslims must "do battle to guard" the dhimmis and "put no burden on them greater than they can bear", was not always upheld, but it remained "a steadfast cornerstone of Islamic policy" into early modern times. ^ a b Nile Green (2016-12-12). Afghanistan's Islam: From Conversion to the Taliban. Cambridge University Press. p. 47. ISBN 9780520294134. ^ a b M. A. Sabhan (1979-03-08). The 'Abbāsid Revolution. Cambridge University Press. p. 11. ISBN 9780521295345. ^ Pike, John. "Göktürk Empire". www.globalsecurity.org. ^ Blankinship, Khalid Yahya (1994). The End of the Jihad State, the Reign of Hisham Ibn 'Abd-al Malik and the collapse of the Umayyads. State University of New York Press. p. 37. ISBN 978-0-7914-1827-7. ^ Gardner, Hall; Kobtzeff, Oleg, eds. (2012). The Ashgate Research Companion to War: Origins and Prevention. Ashgate Publishing. pp. 208–209. ^ Rosenwein, Barbara H. (2004). A Short History of the Middle Ages. Ontario. pp. 71–72. ISBN 978-1-55111-290-9. ^ Penn, Michael Philip (2017). Envisioning Islam. Philadelphia. pp. 45–50. ISBN 978-0-81224-722-0. ^ Jandora, John W. (1985). "The battle of the Yarmūk: A reconstruction". Journal of Asian History. 19 (1): 8–21. JSTOR 41930557. ^ Grant, Reg G. (2011). "Yarmuk". 1001 Battles That Changed the Course of World History. p. 108. ISBN 978-0-7893-2233-3. ^ Nicolle (2009), pp. 14–15. ^ a b Nicolle (2009), p. 15. ^ Nicolle (2009), pp. 17–18. ^ a b c d e f Nicolle (2009), p. 18. ^ a b c Nicolle (2009), p. 19. ^ a b c d Nicolle (2009), p. 22. ^ a b Nicolle 2009, p. 49. ^ Foss, Clive (1975). "The Persians in Asia Minor and the end of antiquity". The English Historical Review. 90 (357): 721–747. doi:10.1093/ehr/XC.CCCLVII.721. JSTOR 567292. ^ Howard-Johnston, James (2006). East Rome, Sasanian Persia And the End of Antiquity: Historiographical And Historical Studies. Ashgate Publishing. p. xv. ISBN 978-0-86078-992-5. ^ Liska, George (1998). "Projection contra prediction: Alternative futures and options". Expanding Realism: The Historical Dimension of World Politics. Rowman & Littlefield. p. 170. ISBN 978-0-8476-8680-3. ^ a b c Nicolle (2009), p. 26. ^ Nicolle (2009), pp. 26–27. ^ Nicolle (2009), p. 28. ^ Nicolle (2009), pp. 28–29. ^ a b Nicolle (2009), p. 30. ^ Nicolle (2009), pp. 31–32. ^ Nicolle (2009), p. 33. ^ Nicolle (2009), pp. 34–35. ^ Nicolle (2009), pp. 36–37. ^ Nicolle (2009), p. 37. ^ a b c Nicolle (2009), p. 38. ^ Nicolle (2009), pp. 38–39. ^ a b c Nicolle (2009), p. 41. ^ a b c Nicolle (2009), p. 43. ^ a b Nicolle (2009), p. 44. ^ a b Nicolle (2009), p. 45. ^ Nicolle (2009), pp. 46–47. ^ Nicolle (2009), pp. 46. ^ a b c d e f g h i Nicolle (2009), p. 47. ^ Nicolle 2009, pp. 63. ^ a b Nicolle 2009, pp. 64. ^ a b Nicolle (2009), p. 50. ^ a b Nicolle (2009), p. 51. ^ a b c Nicolle (2009), p. 54. ^ a b c Nicolle (2009), p. 52. ^ a b Nicolle 2009, p. 55. ^ a b c d e f g h i Nicolle 2009, p. 56. ^ a b c d e f g Nicolle 2009, p. 57. ^ a b c Nicolle 2009, p. 58. ^ Robinson, Chase F. (2010). "The rise of Islam, 600 705". In Robinson, Chase F. The New Cambridge History of Islam, Volume 1: The Formation of the Islamic World, Sixth to Eleventh Centuries. Cambridge University Press. p. 197. ISBN 9780521838238. it is probably safe to assume that Muslims were often outnumbered. Unlike their adversaries, however, Muslim armies were fast, agile, well coordinated and highly motivated. ^ a b G. Yver. Encyclopedia of Islam 2nd ed, Brill. "Maghreb", vol. 5, p. 1189. ^ a b Nicolle 2009, pp. 65. ^ Nicolle 2009, p. 72-73. ^ a b c Nicolle 2009, p. 75. ^ Nile Green (2016-12-12). Afghanistan's Islam: From Conversion to the Taliban. Cambridge University Press. pp. 43, 44. ISBN 9780520294134. ^ Nile Green (2016-12-12). Afghanistan's Islam: From Conversion to the Taliban. Cambridge University Press. pp. 44, 46–47. ISBN 9780520294134. ^ M. Longworth Dames. Encyclopedia of Islam 2nd ed, Brill. "Afghanistan", vol. 1, p. 226. ^ Nicolle 2009, pp. 91. ^ Nicolle 2009, pp. 80-84. ^ Esposito (1998), p. 34. "They replaced the conquered countries, indigenous rulers and armies, but preserved much of their government, bureaucracy, and culture. For many in the conquered territories, it was no more than an exchange of masters, one that brought peace to peoples demoralized and disaffected by the casualties and heavy taxation that resulted from the years of Byzantine-Persian warfare. Local communities were free to continue to follow their own way of life in internal, domestic affairs. In many ways, local populations found Muslim rule more flexible and tolerant than that of Byzantium and Persia. Religious communities were free to practice their faith to worship and be governed by their religious leaders and laws in such areas as marriage, divorce, and inheritance. In exchange, they were required to pay tribute, a poll tax (jizya) that entitled them to Muslim protection from outside aggression and exempted them from military service. Thus, they were called the "protected ones" (dhimmi). In effect, this often meant lower taxes, greater local autonomy, rule by fellow Semites with closer linguistic and cultural ties than the hellenized, Greco-Roman élites of Byzantium, and greater religious freedom for Jews and indigenous Christians." ^ Cahen (1991), p. 560; Anver M. Emon, Religious Pluralism and Islamic Law: Dhimmis and Others in the Empire of Law, p. 98, note 3. Oxford University Press, ISBN 978-0199661633. Quote: "Some studies question the nearly synonymous use of the terms kharaj and jizya in the historical sources. The general view suggests that while the terms kharaj and jizya seem to have been used interchangeably in early historical sources, what they referred to in any given case depended on the linguistic context. If one finds references to "a kharaj on their heads," the reference was to a poll tax, despite the use of the term kharaj, which later became the term of art for land tax. Likewise, if one fins the phrase "jizya on their land," this referred to a land tax, despite the use of jizya which later come to refer to the poll tax. Early history therefore shows that although each term did not have a determinate technical meaning at first, the concepts of poll tax and land tax existed early in Islamic history." Denner, Conversion and the Poll Tax, 3–10; Ajiaz Hassan Qureshi, "The Terms Kharaj and Jizya and Their Implication," Journal of the Punjab University Historical Society 12 (1961): 27–38; Hossein Modarressi Rabatab'i, Kharaj in Islamic Law (London: Anchor Press Ltd, 1983). ^ a b c Tramontana, Felicita (2013). "The Poll Tax and the Decline of the Christian Presence in the Palestinian Countryside in the 17th Century". Journal of the Economic and Social History of the Orient. 56 (4–5): 631–652. doi:10.1163/15685209-12341337. The (cor)relation between the payment of the poll-tax and conversion to Islam, has long been the subject of scholarly debate. At the beginning of the twentieth century scholars suggested that after the Muslim conquest the local populations converted en masse to evade the payment of the poll tax. This assumption has been challenged by subsequent research. Indeed Dennett's study clearly showed that the payment of the poll tax was not a sufficient reason to convert after the Muslim conquest and that other factors—such as the wish to retain social status—had greater influence. According to Inalcik the wish to evade payment of the jizya was an important incentive for conversion to Islam in the Balkans, but Anton Minkov has recently argued that taxation was only one of a number of motivations. ^ Dennett (1950), p. 10. "Wellhausen makes the assumption that the poll tax amounted to so little that exemption from it did not constitute sufficient economic motive for conversion." ^ a b Lewis, Bernard (2014). The Jews of Islam. Princeton University Press. p. 19. ISBN 9781400820290. Cahen, Claude (1991). "Ḏj̲izzya". Encyclopaedia of Islam. 2 (2nd ed.). Brill. Cohen, Mark (2008). Under Crescent and Cross: The Jews in the Middle Ages. Princeton: Princeton University Press. ISBN 978-0-691-13931-9. Daniel, Elton L. (2010). "The Islamic East". In Robinson, Chase F. The New Cambridge History of Islam, Volume 1: The Formation of the Islamic World, Sixth to Eleventh Centuries. Cambridge University Press. ISBN 9780521838238. Dennett, Daniel Clement (1950). Conversion and the Poll Tax in Early Islam. Harvard University Press. ISBN 9780674331594. Donner, Fred M. (2014). The Early Islamic Conquests. Princeton University Press. Hoyland, Robert G. (2014). In God's Path: The Arab Conquests and the Creation of an Islamic Empire. Oxford University Press. ISBN 978-0-19-991636-8. Kaegi, Walter E. (1995). Byzantium and the Early Islamic Conquests. Cambridge University Press. ISBN 9780521484558. Kennedy, Hugh (2007). The Great Arab Conquests: How the Spread of Islam Changed the World We Live in. Da Capo Press. ISBN 978-0-306-81740-3. Lapidus, Ira M. (2014). A History of Islamic Societies. Cambridge University Press. ISBN 978-0-521-51430-9. Esposito, John L. (1998). Islam: The Straight Path. Oxford University Press. ISBN 978-0-19-511233-7. Nicolle, David (1994). Yarmuk AD 636: The Muslim Conquest of Syria. Osprey Publishing. ISBN 978-1-85532-414-5. Nicolle, David (2009). 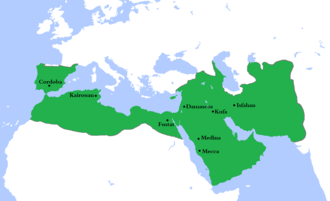 The Great Islamic Conquests AD 632-750. Osprey Publishing. ISBN 978-1-84603-273-8. Stillman, Norman (1979). The Jews of Arab Lands : A History and Source Book. Philadelphia: Jewish Publication Society of America. ISBN 978-0-8276-0198-7. Vaglieri, Laura Veccia (1977). "The Patriarchal and Umayyad caliphates". In Holt, P. M.; Lambton, Ann K. S.; Lewis, Bernard. The Cambridge History of Islam Volume 1A: The Central Islamic Lands from Pre-Islamic Times to the First World War. Cambridge University Press. pp. 57–103. doi:10.1017/CHOL9780521219464.005. ISBN 9780521219464. It covered an area of 190,800 sq mi. 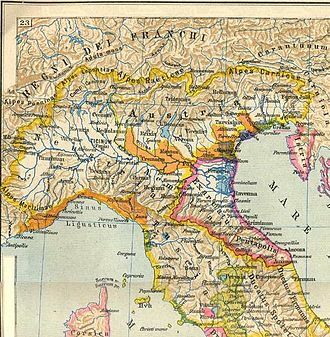 According to the testimony of Julius Caesar, Gaul was divided into three parts, Gallia Celtica and Aquitania, during the 2nd and 1st centuries BC, Gaul fell under Roman rule, Gallia Cisalpina was conquered in 203 BC and Gallia Narbonensis in 123 BC. Gaul was invaded after 120 BC by the Cimbri and the Teutons, Gallia remains a name of France in modern Greek and modern Latin. The Greek and Latin names Galatia, and Gallia are ultimately derived from a Celtic ethnic term or clan Gal-to-. Galli of Gallia Celtica were reported to refer to themselves as Celtae by Caesar. Hellenistic folk etymology connected the name of the Galatians to the supposedly milk-white skin of the Gauls, modern researchers say it is related to Welsh gallu, Cornish galloes, power, thus meaning powerful people. The English Gaul is from French Gaule and is unrelated to Latin Gallia, as adjectives, English has the two variants and Gallic. The two adjectives are used synonymously, as pertaining to Gaul or the Gauls, although the Celtic language or languages spoken in Gaul is predominantly known as Gaulish. The Germanic w- is regularly rendered as gu- / g- in French, unrelated in spite of superficial similarity is the name Gael. The Irish word gall did originally mean a Gaul, i. e. an inhabitant of Gaul, but its meaning was widened to foreigner, to describe the Vikings, and still the Normans. The dichotomic words gael and gall are sometimes used together for contrast, by 500 BC, there is strong Hallstatt influence throughout most of France. By the late 5th century BC, La Tène influence spreads rapidly across the territory of Gaul. The La Tène culture developed and flourished during the late Iron Age in France, Italy, southwest Germany, Moravia, farther north extended the contemporary pre-Roman Iron Age culture of northern Germany and Scandinavia. 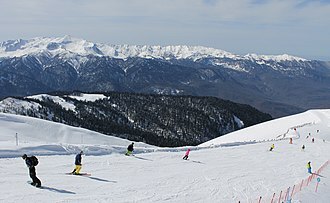 By the 2nd century BC, the Romans described Gallia Transalpina as distinct from Gallia Cisalpina, while some scholars believe the Belgae south of the Somme were a mixture of Celtic and Germanic elements, their ethnic affiliations have not been definitively resolved. The Umayyad Caliphate, spelled Omayyad, was the second of the four major caliphates established after the death of Muhammad. This caliphate was centred on the Umayyad dynasty, hailing from Mecca, Syria remained the Umayyads main power base thereafter, and Damascus was their capital. The Umayyads continued the Muslim conquests, incorporating the Caucasus, Sindh, the Maghreb and the Iberian Peninsula into the Muslim world. At its greatest extent, the Umayyad Caliphate covered 11,100,000 km2 and 62 million people, the Umayyad Caliphate was secular by nature. At the time, the Umayyad taxation and administrative practice were perceived as unjust by some Muslims, Muhammad had stated explicitly during his lifetime that Abrahamic religious groups, should be allowed to practice their own religion, provided that they paid the jizya taxation. The welfare state of both the Muslim and the poor started by Umar ibn al Khattab had continued, financed by the zakat tax levied only on Muslims. Muawiyas wife Maysum was a Christian, the relations between the Muslims and the Christians in the state were stable in this time. Prominent positions were held by Christians, some of whom belonged to families that had served in Byzantine governments, the employment of Christians was part of a broader policy of religious assimilation that was necessitated by the presence of large Christian populations in the conquered provinces, as in Syria. This policy boosted Muawiyas popularity and solidified Syria as his power base, the rivalries between the Arab tribes had caused unrest in the provinces outside Syria, most notably in the Second Muslim Civil War of AD 680–692 and the Berber Revolt of 740–743. 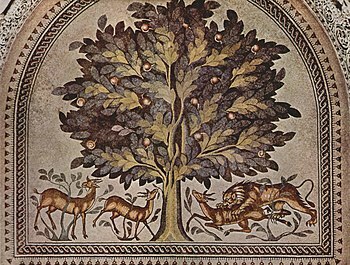 During the Second Civil War, leadership of the Umayyad clan shifted from the Sufyanid branch of the family to the Marwanid branch. 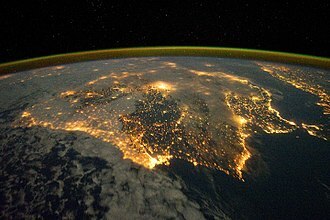 A branch of the family fled across North Africa to Al-Andalus, where they established the Caliphate of Córdoba, according to tradition, the Umayyad family and Muhammad both descended from a common ancestor, Abd Manaf ibn Qusai, and they originally came from the city of Mecca. Muhammad descended from Abd Manāf via his son Hashim, while the Umayyads descended from Abd Manaf via a different son, Abd-Shams, the two families are therefore considered to be different clans of the same tribe. In the Iron Age, it was controlled by the Neo-Assyrian and Neo-Babylonian Empires. The Sumerians and Akkadians dominated Mesopotamia from the beginning of history to the fall of Babylon in 539 BC. It fell to Alexander the Great in 332 BC, and after his death, around 150 BC, Mesopotamia was under the control of the Parthian Empire. Mesopotamia became a battleground between the Romans and Parthians, with parts of Mesopotamia coming under ephemeral Roman control. In AD226, eastern part of it fell to the Sassanid Persians, division of Mesopotamia between Roman and Sassanid Empires lasted until the 7th century Muslim conquest of Persia of the Sasanian Empire and Muslim conquest of the Levant from Byzantines. A number of primarily neo-Assyrian and Christian native Mesopotamian states existed between the 1st century BC and 3rd century AD, including Adiabene and Hatra, Mesopotamia is the site of the earliest developments of the Neolithic Revolution from around 10,000 BC. The regional toponym Mesopotamia comes from the ancient Greek root words μέσος middle and ποταμός river and it is used throughout the Greek Septuagint to translate the Hebrew equivalent Naharaim. In the Anabasis, Mesopotamia was used to designate the land east of the Euphrates in north Syria, the Aramaic term biritum/birit narim corresponded to a similar geographical concept. The neighbouring steppes to the west of the Euphrates and the part of the Zagros Mountains are often included under the wider term Mesopotamia. A further distinction is made between Northern or Upper Mesopotamia and Southern or Lower Mesopotamia. Upper Mesopotamia, known as the Jazira, is the area between the Euphrates and the Tigris from their sources down to Baghdad, Lower Mesopotamia is the area from Baghdad to the Persian Gulf and includes Kuwait and parts of western Iran. 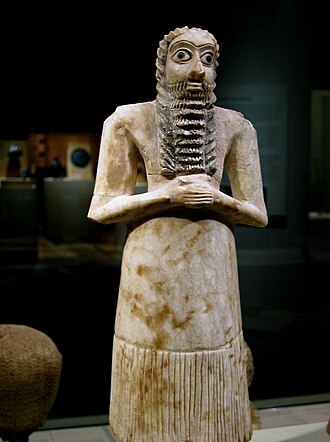 In modern academic usage, the term Mesopotamia often has a chronological connotation and it is usually used to designate the area until the Muslim conquests, with names like Syria and Iraq being used to describe the region after that date. It has been argued that these euphemisms are Eurocentric terms attributed to the region in the midst of various 19th-century Western encroachments, Mesopotamia encompasses the land between the Euphrates and Tigris rivers, both of which have their headwaters in the Armenian Highlands. The Chalukya dynasty was an Indian royal dynasty that ruled large parts of southern and central India between the 6th and the 12th centuries. During this period, they ruled as three related yet individual dynasties, the earliest dynasty, known as the Badami Chalukyas, ruled from Vatapi from the middle of the 6th century. The Badami Chalukyas began to assert their independence at the decline of the Kadamba kingdom of Banavasi, after the death of Pulakeshin II, the Eastern Chalukyas became an independent kingdom in the eastern Deccan. They ruled from Vengi until about the 11th century and these Western Chalukyas ruled from Kalyani until the end of the 12th century. The rule of the Chalukyas marks an important milestone in the history of South India, the political atmosphere in South India shifted from smaller kingdoms to large empires with the ascendancy of Badami Chalukyas. A Southern India-based kingdom took control and consolidated the entire region between the Kaveri and the Narmada rivers, the rise of this empire saw the birth of efficient administration, overseas trade and commerce and the development of new style of architecture called Chalukyan architecture. Kannada literature, which had enjoyed royal support in the 9th century Rashtrakuta court found eager patronage from the Western Chalukyas in the Jain, the 11th century saw the birth of Telugu literature under the patronage of the Eastern Chalukyas. While opinions vary regarding the origins of the Chalukyas, the consensus among noted historians such as John Keay. Sircar, Hans Raj, S. Sen, Kamath, K. V. Ramesh, a theory that they were descendants of a 2nd-century chieftain called Kandachaliki Remmanaka, a feudatory of the Andhra Ikshvaku was put forward. This according to Kamath has failed to explain the difference in lineage, the Kandachaliki feudatory call themselves Vashisthiputras of the Hiranyakagotra. The Chalukyas, address themselves as Harithiputras of Manavyasagotra in their inscriptions, which is the lineage as their early overlords. This makes them descendants of the Kadambas, the Chalukyas took control of the territory formerly ruled by the Kadambas. A record of Eastern Chalukyas mentions the northern origin theory and claims one ruler of Ayodhya came south, defeated the Pallavas and she had a child called Vijayaditya who is claimed to be the Pulakeshin Is father. The Tang dynasty was an imperial dynasty of China preceded by the Sui dynasty and followed by the Five Dynasties and Ten Kingdoms period. It is generally regarded as a point in Chinese civilization. 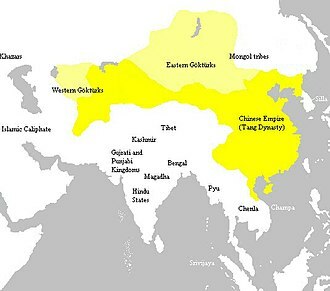 Its territory, acquired through the campaigns of its early rulers, rivaled that of the Han dynasty. The dynasty was founded by the Lǐ family, who seized power during the decline, the dynasty was briefly interrupted when Empress Wu Zetian seized the throne, proclaiming the Second Zhou dynasty and becoming the only Chinese empress regnant. In two censuses of the 7th and 8th centuries, the Tang records estimated the population by number of registered households at about 50 million people. Various kingdoms and states paid tribute to the Tang court, while the Tang conquered or subdued several regions which it controlled through a protectorate system. Besides political hegemony, the Tang exerted a powerful influence over neighboring states such as those in Korea, Japan. Like the previous Sui dynasty, the Tang dynasty maintained a service system by recruiting scholar-officials through standardized examinations and recommendations to office. This civil order was undermined by the rise of military governors known as jiedushi during the 9th century. Chinese culture flourished and further matured during the Tang era, it is considered the greatest age for Chinese poetry. Two of Chinas most famous poets, Li Bai and Du Fu, belonged to this age, as did many famous painters such as Han Gan, Zhang Xuan, there was a rich variety of historical literature compiled by scholars, as well as encyclopedias and geographical works. The adoption of the title Tängri Qaghan by the Tang Emperor Taizong in addition to his title as emperor was eastern Asias first simultaneous kingship, there were many notable innovations during the Tang, including the development of woodblock printing. Buddhism became an influence in Chinese culture, with native Chinese sects gaining prominence. However, Buddhism would be persecuted by the state, subsequently declining in influence, although the dynasty and central government were in decline by the 9th century and culture continued to flourish. Sogdiana was a province of the Achaemenid Empire, eighteenth in the list on the Behistun Inscription of Darius the Great. 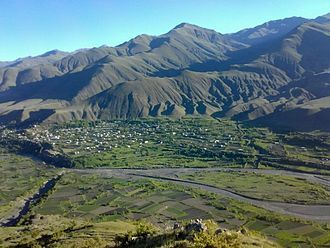 In the Avesta, Sogdiana is listed as the second best land that the supreme deity Ahura Mazda had created and it comes second, after Airyanem Vaejah, homeland of the Aryans, in the Zoroastrian book of Vendidad, indicating the importance of this region from ancient times. Sogdiana was conquered by the Macedonian ruler Alexander the Great in 328 BC and formed part of the Greco-Bactrian Kingdom, the Sogdian states, although never politically united, were centred on the main city of Samarkand. Sogdiana lay north of Bactria, east of Khwarezm, and southeast of Kangju between the Oxus and the Jaxartes, embracing the valley of the Zeravshan. Sogdian territory corresponds to the provinces of Samarkand and Bokhara in modern Uzbekistan as well as the Sughd province of modern Tajikistan. During the High Middle Ages, Sogdian cities included sites stretching towards Issyk Kul such as that at the site of Suyab. Sogdian, an Eastern Iranian language, is no longer a spoken language and it was widely spoken in Central Asia as a lingua franca and even served as one of the Turkic Khaganates court languages for writing documents. Sogdians lived in Imperial China and rose to prominence in the military. Sogdian merchants and diplomats traveled as far west as the Byzantine Empire and they played an important part as middlemen in the trade route of the Silk Road. The Sogdian conversion to Islam was virtually complete by the end of the Samanid Empire in 999, coinciding with the decline of the Sogdian language, as it was largely supplanted by Persian. The restored Scythian name is *Skuda, which among the Pontic or Royal Scythians became *Skula, according to Szemerényi, Sogdiana was named from the Skuda form. 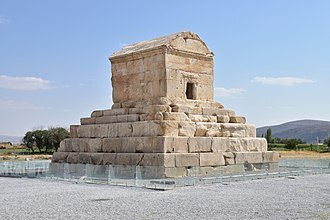 This large-scale migration included Eastern Iranian speaking peoples such as the Sogdians, Achaemenid ruler Cyrus the Great conquered Sogdiana while campaigning in Central Asia in 546–539 BC, a fact mentioned by the ancient Greek historian Herodotus in his Histories. The Abbasid Caliphate was the third of the Islamic caliphates to succeed the Islamic prophet Muhammad. The Abbasid dynasty descended from Muhammads youngest uncle, Abbas ibn Abd al-Muttalib and they ruled as caliphs, for most of their period from their capital in Baghdad in modern-day Iraq, after assuming authority over the Muslim empire from the Umayyads in 750 CE. The Abbasid caliphate first centered its government in Kufa, but in 762 the caliph Al-Mansur founded the city of Baghdad, the political power of the caliphs largely ended with the rise of the Buyids and the Seljuq Turks. Although Abbasid leadership over the vast Islamic empire was reduced to a ceremonial religious function. The capital city of Baghdad became a center of science, culture and this period of cultural fruition ended in 1258 with the sack of Baghdad by the Mongols under Hulagu Khan. The Abbasid line of rulers, and Muslim culture in general, though lacking in political power, the dynasty continued to claim authority in religious matters until after the Ottoman conquest of Egypt. The Abbasid caliphs were Arabs descended from Abbas ibn Abd al-Muttalib, one of the youngest uncles of Muhammad, the Abbasids claimed to be the true successors of Prophet Muhammad in replacing the Umayyad descendants of Banu Umayya by virtue of their closer bloodline to Muhammad. The Abbasids distinguished themselves from the Umayyads by attacking their moral character, according to Ira Lapidus, The Abbasid revolt was supported largely by Arabs, mainly the aggrieved settlers of Marw with the addition of the Yemeni faction and their Mawali. The Abbasids appealed to non-Arab Muslims, known as mawali, Muhammad ibn Ali, a great-grandson of Abbas, began to campaign for the return of power to the family of Prophet Muhammad, the Hashimites, in Persia during the reign of Umar II. During the reign of Marwan II, this culminated in the rebellion of Ibrahim the Imam. On 9 June 747, Abu Muslim successfully initiated a revolt against Umayyad rule. Close to 10,000 soldiers were under Abu Muslims command when the hostilities began in Merv. General Qahtaba followed the fleeing governor Nasr ibn Sayyar west defeating the Umayyads at the Battle of Nishapur, the Battle of Gorgan, after this loss, Marwan fled to Egypt, where he was subsequently assassinated. The remainder of his family, barring one male, were eliminated, immediately after their victory, As-Saffah sent his forces to Central Asia, where his forces fought against Tang expansion during the Battle of Talas. Barmakids, who were instrumental in building Baghdad, introduced the worlds first recorded paper mill in Baghdad, As-Saffah focused on putting down numerous rebellions in Syria and Mesopotamia. The Byzantines conducted raids during these early distractions, the first change the Abbasids, under Al-Mansur, made was to move the empires capital from Damascus, in Syria, to Baghdad in Iraq. Baghdad was established on the Tigris River in 762, a new position, that of the vizier, was established to delegate central authority, and even greater authority was delegated to local emirs. The First Bulgarian Empire was a medieval Bulgarian state that existed in southeastern Europe between the 7th and 11th centuries AD. It was founded circa 681 when Bulgar tribes led by Asparukh moved to the north-eastern Balkans, there they secured Byzantine recognition of their right to settle south of the Danube by defeating – possibly with the help of local South Slavic tribes – the Byzantine army led by Constantine IV. At the height of its power, Bulgaria spread from the Danube Bend to the Black Sea, as the state solidified its position in the Balkans, it entered into a centuries-long interaction, sometimes friendly and sometimes hostile, with the Byzantine Empire. 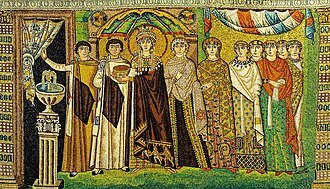 Bulgaria emerged as Byzantiums chief antagonist to its north, resulting in several wars, Byzantium had a strong cultural influence on Bulgaria, which led to the eventual adoption of Christianity in 864. After the disintegration of the Avar Khaganate, the country expanded its territory northwest to the Pannonian Plain, the Bulgarians confronted the advance of the Pechenegs and Cumans, and achieved a decisive victory over the Magyars, forcing them to establish themselves permanently in Pannonia. During the late 9th and early 10th centuries, Simeon I achieved a string of victories over the Byzantines, thereafter, he was recognized with the title of Emperor, and proceeded to expand the state to its greatest extent. After the annihilation of the Byzantine army in the battle of Anchialus in 917, the Byzantines, eventually recovered, and in 1014, under Basil II, inflicted a crushing defeat on the Bulgarians at the Battle of Kleidion. By 1018, the last Bulgarian strongholds had surrendered to the Byzantine Empire, and it was succeeded by the Second Bulgarian Empire in 1185. After the adoption of Christianity, Bulgaria became the center of Slavic Europe. Old Bulgarian became the lingua franca of much of Eastern Europe, in 927, the fully independent Bulgarian Patriarchate was officially recognized. The Bulgars and other tribes in the empire gradually adopted an essentially foreign Slavic language. Since the late 9th century, the names Bulgarians and Bulgarian gained prevalence and became permanent designations for the local population, the First Bulgarian Empire became known simply as Bulgaria since its recognition by the Byzantine Empire in 681. One of the Nimrud ivories shows a lion eating a man. Neo-Assyrian period, 9th to 7th centuries BC. Makli Hill is one of the largest necropolises in the world. 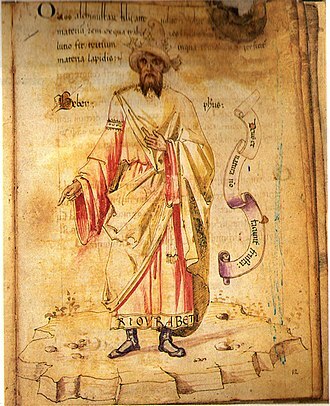 Jabir ibn Hayyan, "the father of Chemistry"
Seal discovered in excavations at Khazar sites. 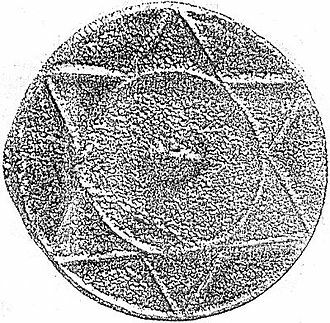 However, rather than having been made by Jews, these appear to be shamanistic sun discs. Sogdian soldier circa 338 BCE, tomb of Artaxerxes III. Sogdians in a religious procession, a 5th–6th-century tomb mural discovered at Tung-wan City. Adalgis, defeated by Charlemagne, opts for exile. Varaha (the boar-headed Vishnu avatar), on a Gurjara-Pratihara coin. 850–900 CE. British Museum. The Kabul Shahi or Hindu Shahi in Asia in 800 CE. Asia in AD 565, showing the Shahi kingdoms and their neighbours. Newly excavated Buddhist stupa at Mes Aynak in Logar Province. Similar stupas have been discovered in neighbouring Ghazni Province, including in the northern Samangan Province. Abbasid Shahi-inspired coin, Iraq 908–930. British Museum. Hephthalite king wearing the crown of Sasanian Emperor Peroz I.
Hephthalite coin with Sasanian-style bust imitating Khavadh I, whom the Hephthalites had helped to the Sasanian throne. Late 5th century CE. Coin of the Hephthalites circa 350 CE, possibly from Bactria, imitating a coin of Shapur I.
Timurid conqueror Babur exiles his treacherous relative Muḥammad Ḥusaym Mīrzā to Khorasan. A Persian manuscript from the 15th century describing the constructing of al-Khornaq Castle in al-Hirah.